On an invitation by Dabiran Platfomr a secular Organisation based in Kurdistan, Houzan Mahmoud gave a talk at the largest secular conference in the city of Sulaymania. The conference took three days, and various important issues were discussed in relation to secularisation, women’s rights, the constitution, and the education system. Houzan gave a talk about secular feminism and the attempt of Islamists to Islamise feminism through notions of women’s “rights and freedoms” within Islam. Houzan argued that if we speak about women and rights it has to be within a secular framework, not an Islamist one. 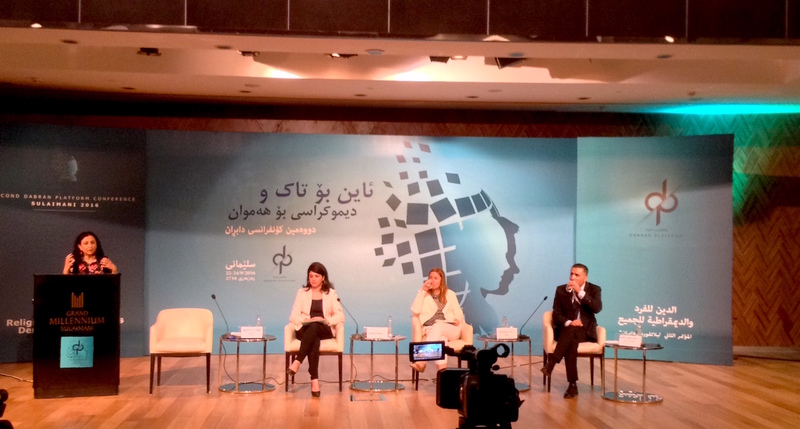 While the conference was live broadcasted nationally on air, various television channels interviewed Houzan on her views and beliefs on why she opposes Islamism and the reasons a secular feminist movement must strive for equality, cultural progress, and freedom. Television channels such as Gali Kurdistan, KNN, NRT, and Rega TV all interviewed Houzan in addition to the Madaniat Radio programme (which lasted 45 minutes), and Chawder newspaper also interviewed Houzan on feminism and the need for a secular feminist movement in Kurdistan. Radfem Collective organised a seminar for Houzan Mahmoud entitled ‘Sharia Courts in the UK and Feminist mobilisation against them’ on the 15th of October 2016. Houzan spoke about the importance of activists who fight for secularism and who have been warning the UK government and the wider society about these Sharia councils and their discriminatory approaches to women based on Islamic Sharia law. The lecture tried to address the problems women are facing under the dictate of religion and religious laws. At the same time, Houzan posed questions to the western feminist consciousness on how women from Muslim backgrounds are victims of Sharia Councils and have been abandoned by Western feminists. On the Sunday of 27th of November 2016, an event was organised by The Kurdish Women’s Centre in Cologne for Houzan Mahmoud during the International Day against violence against women. Houzan gave a brief historical account of gender based violence and ways to effectively tackle it. Culture Project and UCL’s Kurdish Student Society co-hosted a public seminar on secularism, freedom of women and LGBTQ rights on the 9th of December 2016. Houzan Mahmoud, Maryam Namazie (Secularist, co-founder of the British Council for Ex-Muslims, and cofounder of One Law for All), Berivan Gunes (a LLM Student and co-founder of LGBTQ Kurdish platform UK) and Kojin Mirzayi (LLM Student and co-founder of LGBTQ platform UK) all spoke about the plight of women and LGBTQ people under Islamism and how they are treated. They also spoke about the importance of a secular society that will ensure freedom for all people. On Saturday 10th of December 2016, Houzan Mahmoud gave a presentation on the exemplary struggle of Kurdish women against ISIS, and its importance (and effects) on women’s wider struggles elsewhere. The one-day workshop was titled Democratic transformations, Kurdish women and regional conflict: Lessons from Rojava and beyond. The workshop was well attended, and the panelists and presenters were researchers and activists who work on topics concerning the Kurdish question, women’s rights, and gender. It was organised by Greenwich Political Economy Research Centre and Peace in Kurdistan – Women Alliance for Kurdistan, Iraq and Syria.